Even before they moved into the White House, the Lincolns were criticized and attacked from all sides – personally and politically. They were seen as uncouth Westerners who had no business being in Washington. Lincoln was elected with only 39% of the vote and generally remained unpopular throughout his presidency. To physically illustrate this and communicate the pressures upon the Lincolns, a dark, crooked, unsettling hallway was constructed through which the visitors pass. 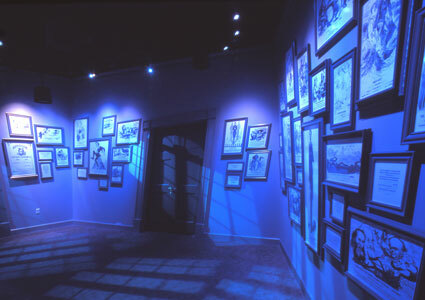 Along the walls you will discover actual political cartoons of the period - which was quite an art form then – as well as genuine quotes from newspapers regarding the Lincolns’ appearance, manners, and policies. As you walk through you will hear voices whispering some of the many mean things that were said about the Lincolns in their first year and half in office.